Roseau, Dominica – Discover Dominica Authority and the Waitukubuli National Trail Project (WNTP) will announce the official opening for the first two segments of the Waitukubuli National Trail at their Summer Adventure and Hike Event, Sunday, August 29. Once completed, the Waitukubuli National Trail (WNT) will be the first and only walking trail that traverses the entire Caribbean island. The trail will run from the south to the north, with a distance of 115 miles. It will be divided into 14 different segments with levels varying from easy family hikes to longer and more challenging hikes. Each trail will offer breathtaking views of Dominica’s unspoiled nature, pristine waterfalls and lush rainforests. The event will highlight on-going work of the WNTP, feature a series of activities including hiking events for children and adults, the unveiling of the first billboard promoting the WNTP and will end with a closing ceremony by the WNTP Project Management Unit. The closing ceremony will be concluded with entertainment from Fanatik Band and Club DVD Sounds. Activities will begin at 10 am and all races will be held on Segments 4 and 5 of the WNT, covering the community of Sylvania and the Emerald Pool. Following the competitions, activities will be held within Sylvania. Known as “the Nature Island” and located between the French islands of Guadeloupe and Martinique in the Eastern Caribbean, the independent nation of Dominica (pronounced “dom-in-eek-a”) is the largest and most mountainous of the Windward Islands, encompassing an area of nearly 290 square miles. Of volcanic origins with mountains reaching heights of nearly 5,000 feet, rainforests that are considered among the last true oceanic rainforests in the world, more than 365 rivers, waterfalls the second largest Boiling Lake in the world and pristine coral reefs, Dominica’s natural diversity is truly unique. Dominica is also home to the last remaining settlement of Indigenous People of the Caribbean – The Carib Indians. A place where man and nature live in harmony, adventurers and nature lovers alike will revel in the Island’s eco-tourism options which include scuba diving, snorkeling, mountain biking, kayaking, horseback riding, nature tours, hiking/trekking, whale, dolphin and bird watching, sailing and fishing. Dominica continues to be recognized for its attributes and responsible tourism efforts, including being the first country in the world to receive Benchmarking designation from the prestigious eco-tourism organization Green Globe 21. National Geographic’s Center for Sustainable Destination ranked the island as the top sustainable island in the Caribbean and among the top ten in the world. Dominica was recognized by Islands Magazine and was included in its 2007 Blue List for being a leader in responsible tourism and ensuring an environmentally and culturally sound island for future generations. Travel + Leisure also announced Dominica as one of the most compelling destinations to visit in their 100 Greatest Trips 2008 edition. Most recently, Dominica was recognized as the 2nd most “pure island” in the world in the April/May 2010 issue of Islands Magazine. For more information on Dominica, contact Discover Dominica Authority at 866-522-4057. Or, visit Dominica’s official website: www.discoverdominica.com or follow Dominica on Twitter, YouTube and Facebook. Mango Bay in Barbados entices travelers with a vacation beyond the average all-inclusive, featuring shopping excursions to the capital city of Bridgetown as well as catamaran sailings off the resorts beachfront property. 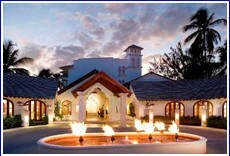 All-inclusive resorts typically offer guests amenities such as meals, drinks and accommodations, but Mango Bay in Barbados (http://www.MangoBayBarbados.com) entices travelers with a vacation beyond the average all-inclusive, featuring shopping excursions to the capital city of Bridgetown as well as catamaran sailings off the resorts beachfront property. Guests of the boutique-style, 76-room, Mango Bay have the option of exploring the shopping mecca of Bridgetown on Mondays, Wednesdays and Fridays, with transportation leaving directly from the hotel. Walk along Broad Street, the main street of Bridgetown, discovering numerous duty free shops, department stores and local restaurants. Conveniently, on Tuesdays, Thursdays and Saturdays visitors can embark on a catamaran trip off the resorts coastline – a perfect escape after a day of walking around the island’s bustling metropolis of Bridgetown. Guests sail for two hours and enjoy snorkeling and sunbathing on the open sea. In addition, a Mango Bay all-inclusive experience includes hotel accommodations, all meals, afternoon tea, all local and brand name drinks including wine with dinner, use of the resorts new gym, watersports (waterskiing, hobiecat sailing, kayaking and snorkeling) and nightly entertainment. Spa treatments are available for an additional fee at Elements Spa located at the resort. All-inclusive rates through Dec. 14, 2010 are $425 in Standard accommodations; $440 in a Standard one-bedroom apartment; $456 in a Superior room; $500 in a Deluxe room; $575 for an Oceanfront room; and $1,500 for the Penthouse Suite. Rates quoted are per room, per night, based on double occupancy and do not reflect the discount. Located in the historic Holetown area on the famed Gold Coast of Barbados, the 76-room Mango Bay is known for its casual sophistication and all-inclusive value. This beachfront, boutique-style property is the ideal tropical retreat for travelers seeking an escape from the everyday hustle and bustle – an oasis where warm breezes, delightful Caribbean sunshine, and picturesque beaches are refreshing and revitalizing. Spacious accommodations, a centrally-located swimming pool, delicious dining and tremendous all-inclusive value make Mango Bay a truly exceptional “Uncomplicated, Unencumbered, Unforgettable” vacation paradise. The property is within walking distance of many shops in Holetown, 25 minutes from the capital city of Bridgetown, and 40 minutes from Grantley Adams International Airport. For more information on Mango Bay, Barbados contact the resort at telephone 246-432-1384, e-mail reservations@MangoBayBarbados.com, or visit www.MangoBayBarbados.com. Food fans in search of an exciting fall event are expected to flock to the 2010 Food Network New York City Wine & Food Festival on October 8-10, 2010. As Food Network gears up for one of its most popular annual events, Food Network Travel is offering exclusive packages to the Big Apple’s hottest wine and food extravaganza with VIP access to several events. A limited amount of packages are available to guests, which provide exclusive access to Food Network Chefs and an invitation to a private event. This intimate group will have a two nights stay at the brand new Eventi Hotel in the historic Chelsea neighborhood from October 8-10, 2010. This is the second festival in which Food Network Travel is providing special access to food lovers. Last month, Food Network Travel offered packages to the Food Network Atlantic City Food & Wine Festival, which sold out in three weeks. Guests will enjoy credential access to select events as well as exclusive experiences ONLY available to Food Network Travel guests. The package includes a VIP ticket to a private Cocktail Hour at Food Network Kitchens with celebrity chefs Melissa d’Arabian ( Ten Dollar Dinners with Melissa d’Arabian) and the Season 6 Winner of the Next Food Network Star ! Aarti Sequiera. This event is only for Food Network Travel guests providing a truly intimate experience to meet and mingle with Melissa and Aarti. Additionally, invitations to attend Tacos & Tequila hosted by Bobby Flay ( Throwdown with Bobby Flay), which is already sold out to the public will be available as well as special reserved seating at the Paula Deen’s Brunch ( Paula’s Home Cooking). The best part is guests won’t have to wait in long lines with speedline access to the Grand Tasting and to Sweet hosted by Duff Goldman ( Ace of Cakes) and Sandra Lee ( Semi-Homemade Cooking). The cost of the Food Network Travel package includes two nights hotel accommodations (including taxes) at the Eventi Hotel, NYC and VIP tickets to the events detailed below. Package prices, including all taxes and fees start at $2040 for single occupancy and $2820 per couple, double occupancy. Guests wishing to book may do so through: www.FoodNetworkTravel.com. For more information or to book, visit: www.FoodNetworkTravel.com. Take advantage of last-minute cruise deals with MSC Cruises for its fall foliage cruises to Canada/New England onboard MSC Poesia with prices from $429 through August 31. MSC Cruises is offering up to a three-category upgrade (inside to ocean view, ocean view to balcony standard, and balcony standard to balcony superior) for guests who book select fall foliage cruises from New York City and Quebec City for six to 14-nights. 6-night “Maple Leaves & Mansions” cruise from Quebec City and calling in Sydney, Nova Scotia; Boston, Massachusetts; Newport, Rhode Island; and New York, New York. 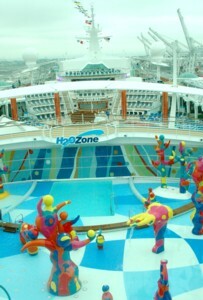 October 23; rates begin at $499 (plus $81.40 pp. GFTs). The 7-night, October 16 and 6-night October 23 cruises can be combined into a 13-night roundtrip, New York cruise with rates from $899 representing an additional savings of $100 per person. Other cruises with longer durations are available. Rates are available for residents of the US and Canada; offer is per person, based upon double occupancy, cruise only, and subject to availability. For more information, call 877-665-4655, or contact a local travel professional. MSC Cruises is one of the fastest-growing cruise lines in the world with a fleet of 11 ships: MSC Magnifica, MSC Splendida, MSC Fantasia, MSC Poesia, MSC Orchestra, MSC Musica, MSC Sinfonia, MSC Armonia, MSC Opera, MSC Lirica and MSC Melody. The fleet cruises year round in the Mediterranean and seasonally in Northern Europe, the Atlantic Ocean, the Caribbean, US and Canada, (Fall 2010), South America, the Indian Ocean, and South and West Africa. Grafton Forge, a regional center for the preservation, promotion and education of the art of blacksmithing is offering two learn to blacksmith programs this fall. One class will be a week-long class in September and the other will be a three consecutive weekend program in November. For those wishing to stay on the premises, a special lodging price is offered at The Old Tavern at Grafton, an historic country inn located steps from Grafton Forge. Owned by the Windham Foundation and operated by noted blacksmith and educator Adam Howard, Grafton Forge’s mission is to further of the art of blacksmithing and the share its vital role past and present in the daily life, economy and community of Grafton and rural Vermont. The shop is host to visitors from far and near including numerous school groups and others interested in learning about this ancient art and its contemporary applications. The Old Tavern at Grafton is an historic country inn with 45 rooms including seen suites and four guest houses. The inn is located in the heart of Grafton, Vermont, which has been named one of the 10 most beautiful places in America by USA Magazine. 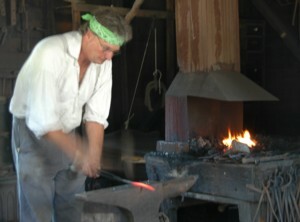 A week-long Forge Class is being offered September 19-24, 2010, at $600 which Includes lodging at The Old Tavern at Grafton, daily breakfast and daily classes at Grafton Forge (for class only, the program is $300). To book, contact: Adam Howard, Grafton Forge, 802-843-1029, graftonforge@windham-foundation.org. Headquartered in Grafton, Vermont, the Windham Foundation is an operating foundation engaged in philanthropic, charitable and educational activities. Since its inception in 1963, its mission is to promote the vitality of Grafton and Vermont’s rural communities through its philanthropic and educational programs and its subsidiaries whose operations contribute to these endeavors. The Foundation is the owner of Grafton Village Cheese Co., The Old Tavern at Grafton, the Retreat Farm and Grafton Village Nursery. Access to Crested Butte this winter is quick and easy thanks to direct, non-stop flights into the Gunnison/Crested Butte (GUC) Airport from several major cities across the country. Crested Butte Mountain Resort (CBMR) announces air service for the 2010-2011 winter season from three major carriers, including American Airlines, Continental Airlines and United Airlines, with flights from Dallas (DFW), Houston (IAH) and Denver (DEN). Through each carrier’s extensive flight network guests can get to Crested Butte from anywhere in the world. And, CBMR’s Friends & Family Fly Free offer makes travel affordable and accessible. United Airlines flights between Denver and Gunnison/Crested Butte run throughout the year. New flights from Houston on Continental, and Dallas/Ft. Worth on American Airlines begin in mid-December 2010 and continue through early April 2011. The Gunnison/Crested Butte airport is located in Gunnison, Colo. and features a hassle-free, convenient travel alternative to the larger airports in the state. Crested Butte is an easy 30-minute drive from the GUC airport and shuttle service and car rentals are available. The Montrose Regional Airport offers another great alternative to driving from one of the state’s larger airports. Montrose is located about one and one-half hours from Crested Butte and the airport hosts direct, non-stop flights from Atlanta, Chicago, Dallas/Ft Worth, Denver, Houston, Los Angeles, Newark and Phoenix. Shuttle service and car rentals are also available from the Montrose Regional Airport. Again this year, guests to CBMR can take advantage of the resort’s Friends & Family Fly Free offer when traveling by air to the Gunnison/Crested Butte airport. The offer is simple: buy two airline tickets and get the third free when staying in CBMR lodging. The maximum number of free tickets per itinerary is three. Four-night minimum stay required. For information or reservations visit the website at www.skicb.com or call Crested Butte Vacations at 800-600-2803. Nestled in the heart of Colorado’s Rocky Mountains, Crested Butte is committed to preserving the pristine landscape and mountain lifestyle. With vibrant Victorian store-fronts and expressive local characters, the small historic town remains true to its heritage and radiates an unparalleled welcoming and inviting spirit that celebrates a simpler life and time. Thanks to a widely diverse landscape, whether beginner or burgeoning national champion, outdoor enthusiasts of all levels will find a new challenge with each visit. From world-class mountain biking, to legendary skiing and snowboarding, to a secluded fly-fishing experience, Crested Butte is one of Colorado’s best-kept secrets. For more information about Crested Butte’s lodging, conference, meeting facilities, and special packages, call Crested Butte Vacations, (800) 600-2803 or visit the web site at www.ridecb.com. For information on ski area real estate opportunities call (970) 349-4999 or (877) 805-6109 or visit the website at www.cbliving.com. 9 of Colorado's ski areas are combining to offer the Colorado Gems ski pass © 2010 Karen Rubin/news-photos-features.com. The Colorado Ski Country USA (CSCUSA) 2010-11 Colorado Gems Card is available now, reminding everyone that ski season is just around the corner. The CSCUSA Gems Card includes unbeatable offers at CSCUSA’s nine Gems ski areas. Cardholders are granted access to free lift tickets at some resorts and major discounts on skiing and riding at many others. The Gems Card is available for $10 and can be ordered at www.ShopColoradoSki.com. Locals and visitors alike purchase their Gems cards early in order to take full advantage of the card’s savings and skiing deals throughout the winter. For only $10, the Gems Card puts world-renowned Colorado skiing within reach for many skiers, in Colorado and elsewhere. All of Colorado’s Gems resorts have their own unique character and feel. Unlike some other mountains, Gems resorts are off the beaten path, are of manageable size, and offer Colorado skiing at its finest. 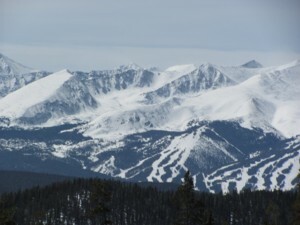 The nine Colorado Gems resorts are: Arapahoe Basin, Echo Mountain, Eldora Mountain Resort, Loveland Ski Area, Monarch Mountain, Powderhorn Resort, Ski Cooper, SolVista Basin, and Sunlight Mountain Resort. No other ski pass in Colorado offers as much savings for such a low price. For more information, or to get a Gems Card, visit www.ShopColoradoSki.com. Cards are available now and throughout the upcoming ski season until they sell out. Statue of Liberty holds high the symbols of freedom © 2010 Karen Rubin/news-photos-features.com. 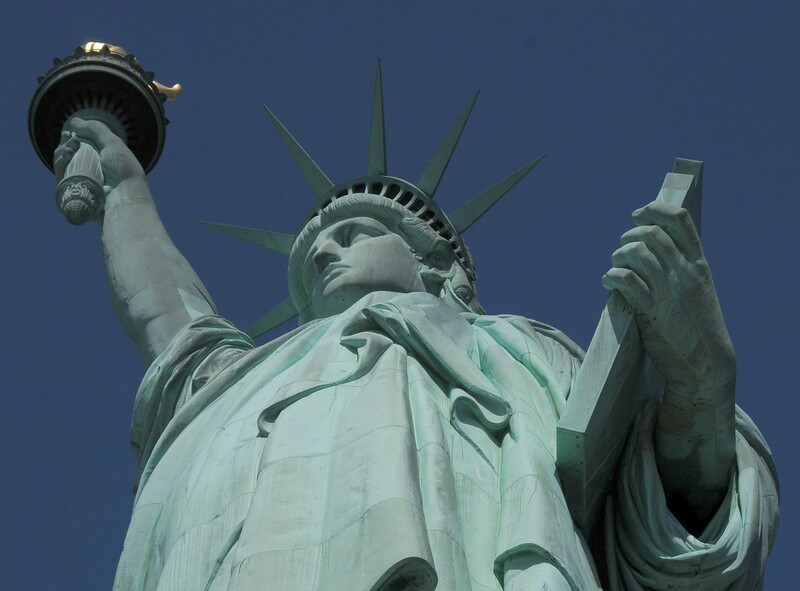 The National Park Service (NPS) is inviting comments on proposed life safety upgrades at the Statue of Liberty National Monument, as part of the Environmental Assessment and Assessment of Effect (EA/AoE) process. Comments can be submitted electronically or by mail, through Sept. 13.
circulation, and emergency egress within the monument would allow compliance with applicable codes to the maximum extent possible without compromising the historic fabric of the monument. 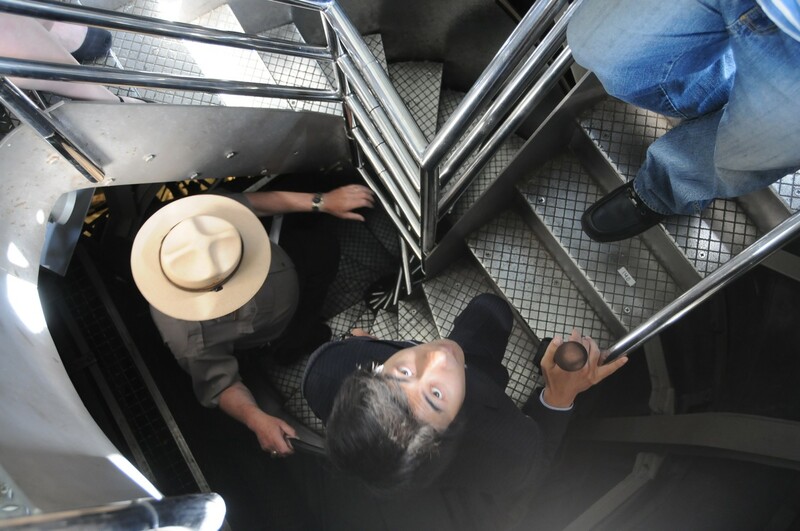 A Park Ranger leads a group up the internal staircase to Statue of Liberty's Crown © 2010 Karen Rubin/news-photos-features.com. This EA/AoE evaluates two alternatives, the preferred alternative and the no action alternative, and also describes alternatives that have been considered but dismissed. The proposed actions involve both the renovation of existing elements and the construction of new features to improve firesafety, accessibility, and circulation within the structure. The proposed actions include the removal of and replacement of existing stairs andelevators as well as upgrades to the fire safety, ventilation, and lighting systems. process and schedule for the project’s consultation and any required mitigation. Those who wish to view and comment on the EA/AoE, may do so between Aug. 13 and Sept. 13 either electronically at http://parkplanning.nps.gov/STLI or by mail to the Park Superintendent at Statue of Liberty National Monument, National Park Service, Liberty Island, New York, NY 10004.
identifying information – may be made publicly available at any time. Whileyou can ask in their comments to withhold personal identifying information from public review, the NPS cannot guarantee that it will be able to do so. Located on a 12-acre island in New York Harbor, the Statue, Liberty Enlightening the World, was a gift of friendship from the people of France to the people of the United States and is a universal symbol of freedom and democracy. The Statue of Liberty was dedicated on October 28, 1886,designated as a National Monument in 1924 and restored for her centennialon July 4, 1986. For young people who grew up watching “High School Musical,” and have graduated to “Glee,” and dream of a musical theatre career – or those who just want to have fun learning a song and dance routine – performing on Broadway is one step closer to reality. Broadway Inside and Out, presented by Broadway Classroom, is an innovative program that allows promising young artists at every skill level an opportunity to study with current Broadway performers, learn music and choreography and see a Broadway show. Each Broadway Inside and Out theatre workshop is priced at $165 per person and begins with the three-hour workshop with a Broadway professional at 9 a.m., followed by lunch at Planet Hollywood and a ticket to see the featured musical. Students, ideal for ages 10 and up, will learn music and choreography from the show, talk one-on-one with Broadway professionals about careers in theatre and have an opportunity for photos and autographs. Over the course of the three-hour workshop, participants will be challenged by working theatre professionals to surpass the level at which they are currently performing by developing skills to learn music and choreography not just quickly, but simultaneously. Team work, listening skills, self-expression, self-esteem and confidence are just some of what students will learn in this high-energy, nurturing and rewarding experience. The deadline for applications for the September 25 Billy Elliot workshop is August 15; for the October 9 West Side Story workshop, applications are due September 1; and October 6 for the November 13 In The Heights workshop. 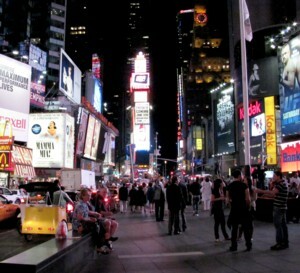 Schedules, information and applications are available at www.broadwayclassroom.com. Workshops are held at Pearl Studios, 500 Eighth Avenue, 12th Floor, New York City. About Broadway Classroom – Since 1998, more than 300,000 students and adults have experienced Broadway Classroom, a series of private workshops for both individuals and groups designed to enhance the Broadway experience. As the leader in educational Broadway workshops, Broadway Classroom’s goal is to inspire students to bring the performing arts to life not only during the workshop, but also in their daily lives. Broadway Classroom is a division of Broadway.com/Groups. For more information visit www.broadwayclassroom.com.